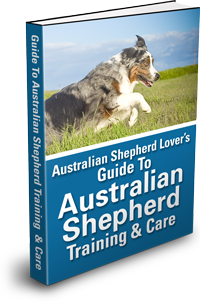 Our affiliate program allows you to promote the e-book Australian Shepherd Lover's Guide To Australian Shepherd Training & Care on your website, Facebook and emails (no spamming of course) and earn a 50% commission for each referral. We use E-Junkie for our affiliate program. When you join our program through E-Junkie you will get a special link that you put on your website to promote the e-book. When a visitor to your website clicks that link they will go to our landing page. If they decide to buy you get the credit for referring the customer. E-Junkie uses PayPal to process the payment and we also use PayPal to pay you. We pay you once a month for all the commissions you have earned for the previous month. For example, for sales generated in September you would get paid at the end of October. First, if you don't already have one, you will need a FREE PayPal account (so we can pay you). Then you just have to get a FREE E-junkie account (to get your affiliate links so we can track your referrals). When you click the following link you will go to E-junkie. If you don't have an account you can create one. Once you have your PayPal and E-junkie accounts and you have joined our affiliate program you just need to get your affiliate link in your E-junkie account. Here's a quick overview of how that works. 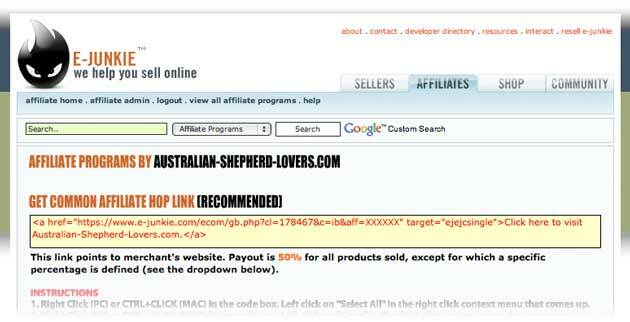 Go into your main "Affiliate Admin" page and click "Get Affiliate Code". 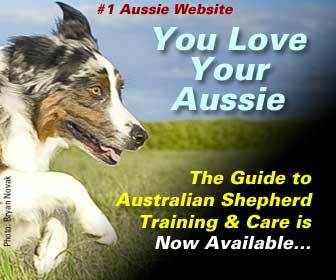 Then select the merchant (that's us) "Australian-Shepherd-Lovers.com" — and click the button "Get Affiliate Code". You will then be given the code for a basic text link. 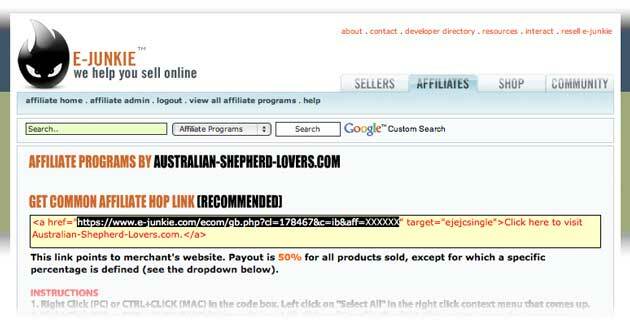 In the example below where you see XXXXXX you would see your unique affiliate number instead. 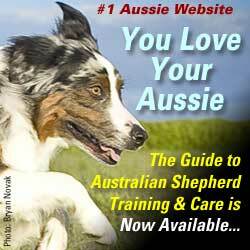 If you use this code you will not want to change the link but you can change the text part that says "Click here to visit Australian-Shepherd-Lovers.com." to whatever text you like. 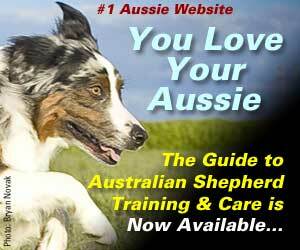 You can use any of these images to help promote the e-book on your website. They are in .png format so they will work on color backgrounds too. You can download them to your computer and then add them to your website. Just right-click on the image with your mouse and choose, "Save Image As..."